The downloading component allows you to offer visitors a link to documents of various types (pdf, images, Word, Excel etc ...) that you file on the server. 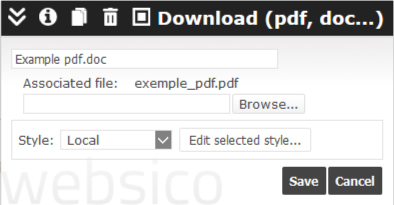 Type in the text of the download link and choose the associated file with the "Browse" button. This file will be copied to the server and will become a link destination. The text displayed is a link, therefore changing the appearance must be done by applying adjustments to the links.